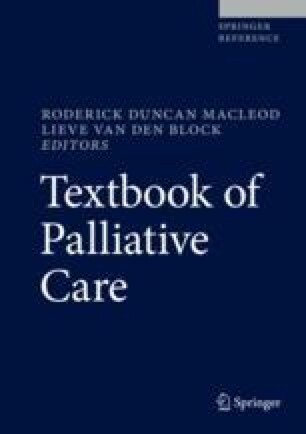 An optimal approach to palliative care for people with dementia has been defined by the European Association for Palliative Care with 11 domains including applicability of palliative care; person-centered care, communication, and shared decision-making; and setting care goals and advance care planning. Not all people with dementia will require specialist palliative care, and all involved in dementia care should be able to provide palliative care focusing on care and treatment which aims to increase the comfort and quality of life of the individual and supporting their family. There are many complications and symptoms which may arise for someone with dementia including increased infections, shortness of breath, swallowing difficulties, and pain which the individual may not be able to clearly express. These complications can lead to difficult decisions which need to be made by not only practitioners but also family caregivers as proxy. There should be a shared decision-making approach to these complications and symptoms, with advance care planning performed where possible. Caring for someone with dementia is one of the most difficult caring roles; support for family caregivers as part of a palliative approach is essential. Each person with dementia is different, and needs should be assessed on an individual basis, adopting a person-centered approach to care.